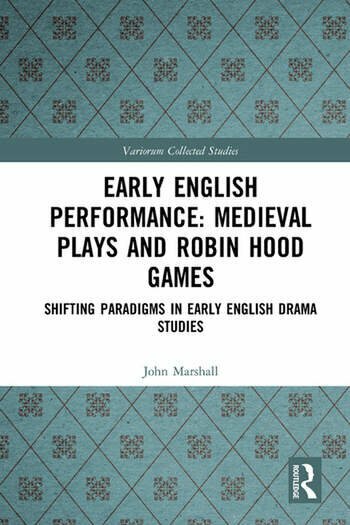 Covering a period of nearly 40 years’ work by the author this collection of essays in the Shifting Paradigms in Early English Drama Studies series brings the perspective of a Drama academic and practitioner of early English plays to the understanding of how medieval plays and Robin Hood games of the fifteenth and sixteenth centuries were performed. It explores why, where, when, and how the plays happened, who took part, and who were the audiences. The insights are informed by a combination of research and the public presentation of surviving texts. The research included in the volume unites the early English experiences of religious and secular performance. This recognition challenges the dominant critical distinction of the past between the two and the consequent privileging of biblical and moral plays over secular entertainments. What further binds, rather than separates, the two is that the destination of funds raised by the different activities maintained the civic and parochial needs of the institutions upon which the people depended. This collection redefines the inclusive nature and common interests of the purposes that lay behind generically different undertakings. They shared an extraordinary investment of human and financial resources in the anticipation of a profit that was pious and practical. John Marshall has spent all of his academic career teaching in university departments of Drama. He taught in the Department of Drama: Theatre, Film and Television (now Department of Theatre), University of Bristol for 20 years. Following his retirement he was appointed Senior Research Fellow in Theatre at the University of Bristol, a post he continues to hold. He has published extensively in the areas of medieval English theatre and Robin Hood in performance. He has also acted in and directed productions of a wide range of plays from both categories.